Jake Gardiner, (above), had two assists last night. The Toronto Maple Leafs are hot. 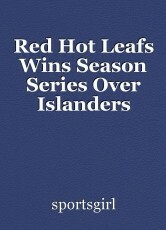 Last night, the Leafs defeated the New York Islanders 5-4, winning the season series. Things didn't start good for the Leafs as Anthony Beauvillier scored New York's first goal at 12:04 of the opening period. At 16:22, Nazem Kadri tied the game on the power play. Johnny Boychuk scored a power play goal at 18:34 to put the isles. ahead 2-1. At 7:56 of the second period, Nikita Zaitsev tied the game. New York went ahead again at 10:45 with a goal by Brock Nelson. Mitch Marner tied the game 3-3 at 17:18. Just 2:01 into the third period, James Van Riemsdyk put Toronto ahead 4-3. John Tavares tied the game on a power play at 6:28. At 16:02, Auston Matthews scored the winner for Toronto. Toronto's defenseman, Jake Gardiner had two assists. Islander's Jordan Eberle and Adam Pelech had two assists last night. The Leafs hosts the Winnipeg Jets tonight. This page was created in 0.5491 seconds.